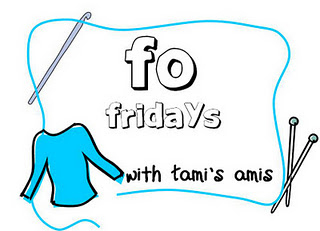 Stitched Together: An FO to be Proud of! An FO to be Proud of! I LOVE this FO. Whilst it is not quite what I envisaged at the start of the project I, still love it very much. 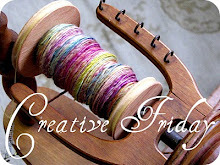 The FO I am talking about is the shawl from my KAL, that I'm running on my Ravelry Group. This shawl is different from my previous attempts because it is knit in 4 ply yarn, rather than 2 ply. As you can imagine this results in something quite different. The lace patterns are much stronger in this heavier weight version, as you can see from this side by side comparison. This new version was knit on the same size needles as the lace weight version and the same pattern was followed, apart from reducing the ruffle by approximately 4 rows. I ran out of the darker accent colour, which was meant to do the edging. If I'd not done the ruffle, I think the darker colour would have been more than sufficient for the border. However, I don't think the striping looks bad. As you can see, there are hints of the paler colour visible in the dark colour, which is impressive as they were dyed by two different dyers. The pale yarn is Posh Yarns Sylvia 4 ply, and the darker yarn is BabyLongLegs Semi-Precious. Obviously I got lucky when I bought these at different times, from different people. It does make rather obvious my love for this particular shade though! 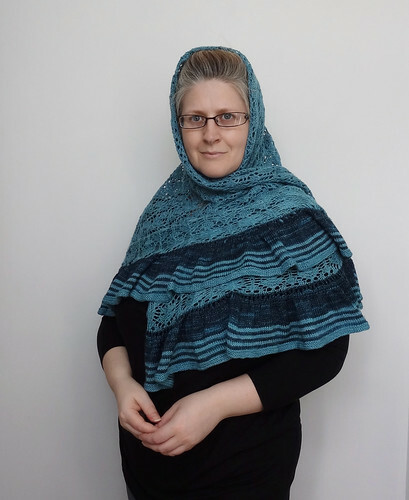 This version of the shawl feels much more substantial and is better at keeping out a draft. 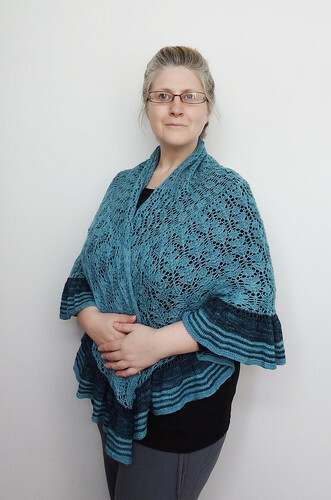 It feel more like I am wearing an extra layer, rather than the invisible but warm layer of the Rowan Fine Lace Shawl, which contains so much alpaca. 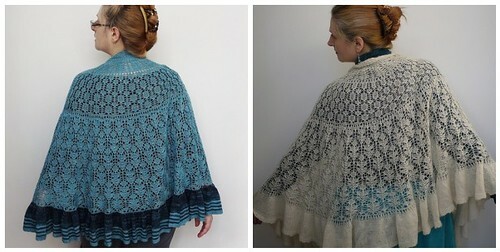 I also think that as this shawl is much heavier, it will stretch out more, so the lace motifs will become less plump. This heavier version may also work during the colder months as an extra layer to keep my head warm! I've just realised that this photo makes me look like I have a massive quiff - ah well - Elvis impersonators, eat your heart out! 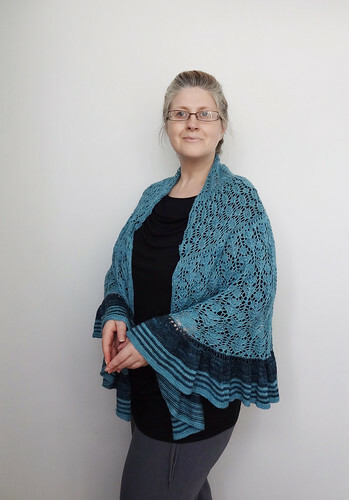 With this version of my Lily's Slice of Pi Shawl pattern, I would suggest either using all three 100g skeins in the same colour, or starting the accent colour, after the increase row at the end of the last lace section and the increase row for the ruffle. I would then knit and purl one row and weigh the yarn before and after those two rows to work out how many rows you will get from the accent skein. I would then decide if I wanted a shorter ruffle or whether I want to do striping, and which order I want to do it. It never ceases to amaze me how I can really love a project and final object, but still think of ways I would change it, if I were to do it again. I think that is one reason I love knitting so much. Each version of a pattern is different. It wouldn't surprise me if I were to knit this shawl again some day, but for now I think 3 versions is enough, even if I only own 2 of them! To look at other people's finished object, click on a button!